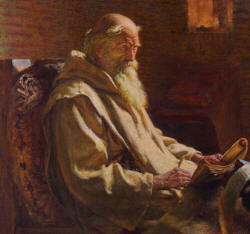 THE year of our Lord 673, remarkable for one of the most important of our Early English Councils, held at Hertford, for the purpose of enforcing certain general regulations of the Church, has an equal claim on our attention, as the year in which that great teacher of Religion, Literature, and Science, Venerable Bede, first saw the light. The time of his birth has, however, been placed by some writers as late as A.D. 677, but this error arose from not perceiving that the last two or three pages of his Chronological Epitome, attached to the Ecclesiastical History, were added by another hand. Bede’s own words appear decisive in fixing the date of his birth:—“This is the present state of Britain, about 285 years since the coming of the Saxons, and in the seven hundred and thirty-first year of our Lord’s incarnation.” To this he subjoins a short Chronology which comes down to 731, and was continued to 734, either by another hand or by Bede himself, at a later period just before his death: he then gives a short account of the principal events of his own life, and says that he has attained (attigisse) the fifty-ninth year of his life. Gehle, in his recent publication on the life of Bede, has not scrupled to fix the year 672, interpreting Bede’s expression that he had attained his fifty-ninth year as implying that he was entering on his sixtieth. On the other hand, another learned critic, whose opinion has been adopted by Stevenson in his Introduction [p. vii], has endeavoured to show that 674 is the true date. But in so unimportant a particular it is hardly worth while to weigh the conflicting opinions; and the intermediate date, so long ago settled by Mabillon, and apparently so naturally resulting from Bede’s own words, is perhaps the best that can be adopted. It is always to be regretted, when little is known of the early life of eminent men, as in all cases where many facts have been handed down to elucidate the early history of such, something or other has invariably broken forth significant of their future life and fortunes. So very little, however, is known of this great ornament of England and Father of the Universal Church, that except his own writings, the letter of Cuthbert his disciple, and one or two other almost contemporary records, we have no means whatever of tracing his private history. who, under God, founded the same church. We cannot be certain as to the exact spot, but it is sufficiently near the mark to ascertain that Bede was born in the neighbourhood of these two monasteries, and probably in the village of Jarrow. Of his parents nothing has been recorded. He tells us, in his own short narrative of himself, that he was placed, at the age of seven years, under the care of Abbot Benedict, in the Abbey of Weremouth, that of Jarrow being not yet built. When, however, this second establishment was founded, Bede appears to have gone thither under Ceolfrid its first Abbot, and to have resided there all the remainder of his life.